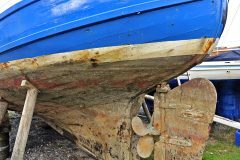 Our ‘Where are they now?’ feature provides brief histories, including build details, of a varied selection of fishing vessels from years gone by. 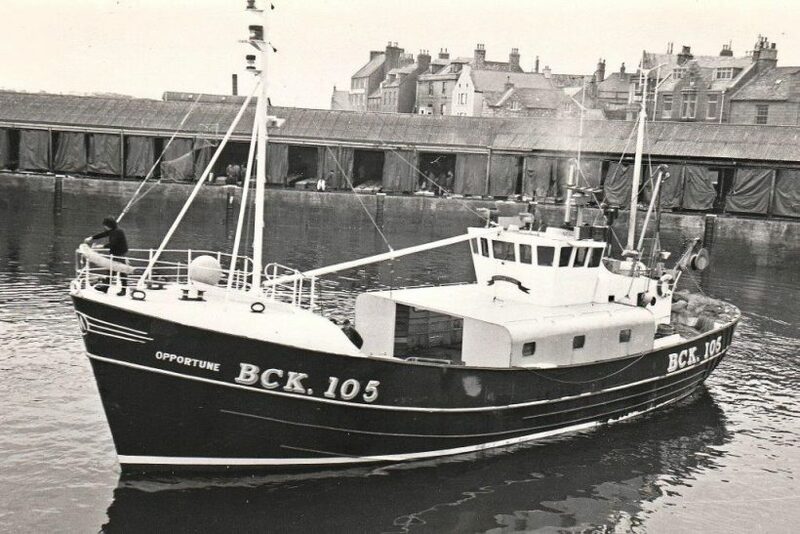 The classic Campbeltown 80 cruiser-sterned seine-net boat Opportune BCK 105 was built for Buckie skipper George Murray by Campbeltown Shipyard in 1973. Featuring a whaleback and gutting shelter, Opportune was powered by a 480hp Caterpillar D346TA main engine. Opportune was bought by Anstruther skipper Alex Gardner and renamed Steadfast II KY 241 in 1982. Four years later, the fly-shooter returned to the Moray Firth. After being renamed Courageous II INS 146 by Lossiemouth skipper Alex Flett, the boat teamed up with another Campbeltown 80, Oceanic INS 100 to form a new pair-seine team. The cruiser-sterned sister vessels were subsequently fitted with transom sterns and three-quarter-length shelterdecks. Courageous II was sold to David and Niall Kirwin of Clogherhead in 1998, and re-registered DA 18, before twin-rigging from Howth until being decommissioned in Denmark in 2008. 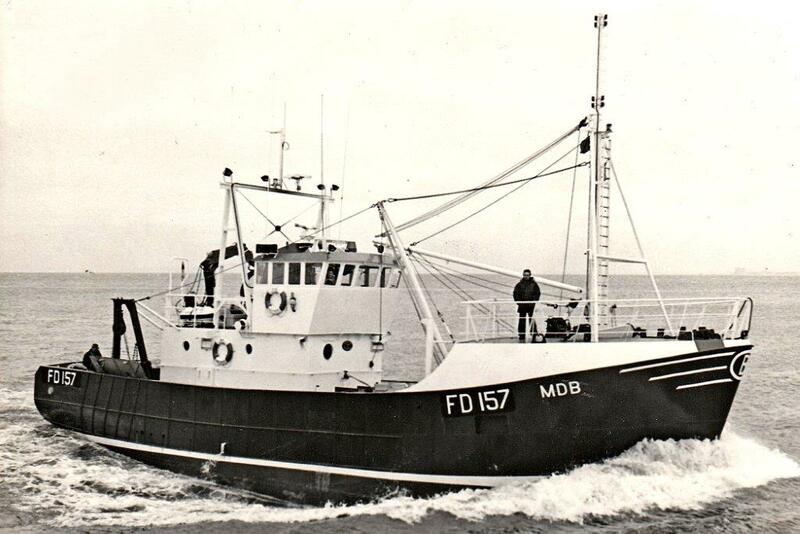 The 74ft open-decked single-rig trawler MDB FD 157 was built by McTay Marine of Bromborough on the Wirral, for Ronald Bond of Fleetwood in 1982. The main dimensions of MDB were LOA 22.57m, registered length 20.69m, beam 6.72m and depth 2.87m. The trawler was powered by a 460hp Callesen engine. MDB moved to Scotland in 1989, when the vessel was bought by Portknockie skipper William Wilson and renamed Forelock BCK 127, regularly landing into Aberdeen. By now fitted with a three-quarter-length shelterdeck, Forelock was bought by Peterhead skipper Willie Ritchie in 1995, when the trawler became Headway PD 229. Three years later, a third change of name saw the vessel become Progress FR 103 when Fraserburgh skipper Bruce Masson purchased the boat. Progress sank 70 miles off Aberdeen in 2000. 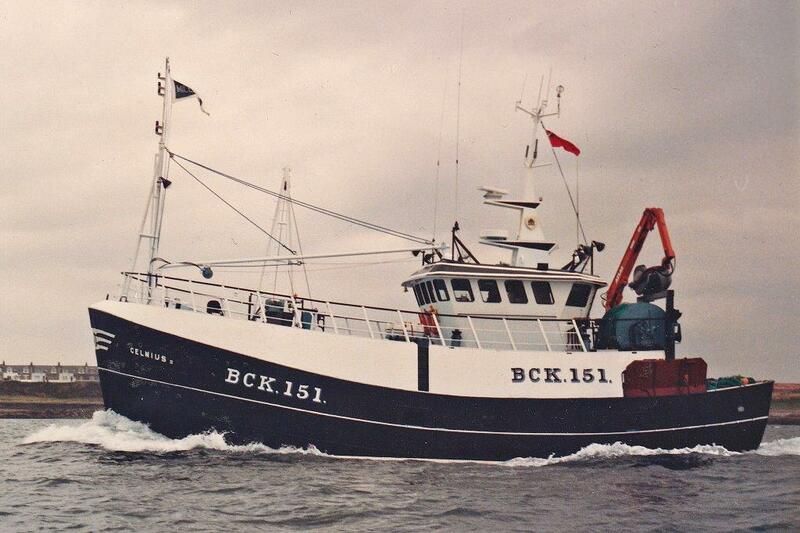 James N Miller Ltd of St Monans built the 65ft steel-hulled trawler Celnius II for Buckie skipper William John Mair and John Cowie in 1988, to replace the 55ft forward-wheelhouse trawler Celnius BCK 151 built by Herd & MacKenzie in 1972. Designed for twin-rig trawling, fitted with a three-drum trawl winch and a single French-style elevated net drum aft on the shelterdeck, the 550hp Deutz-engined Celnius II worked mainly from Kinlochbervie. Celnius II usually fished the Rockall grounds from April to October each year, targeting ground and round fish. 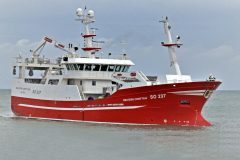 In order to increase the vessel’s capability, endurance and safety when fishing 300 miles from harbour, the trawler was lengthened by Buckie Shipyard in 1997. Work included adding 5ft to the stern section of the hull, fitting a new shaft and larger propeller nozzle, fully enclosing the previously open quarter, fitting three net drums down on the main deck, and installing a new Deutz 619hp engine. Celnius II was decommissioned seven years later. 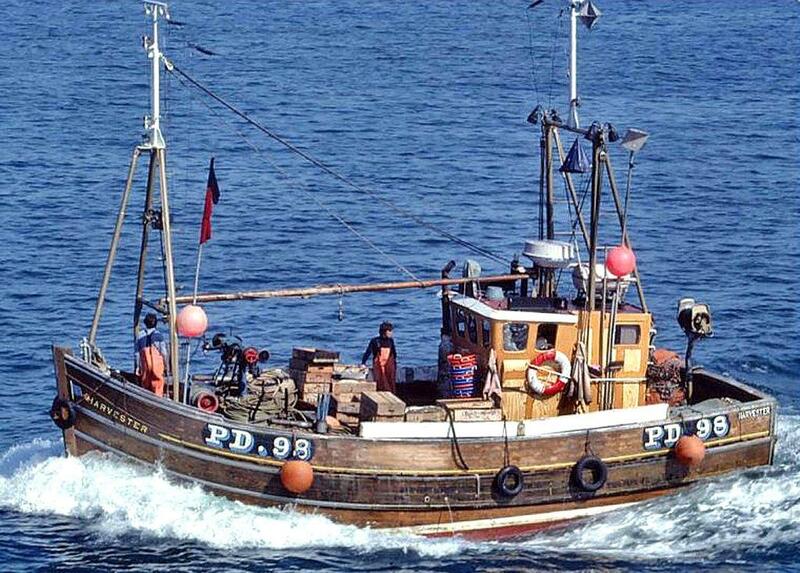 Harvester PD 98 was one of two chunky inshore seiners built by James Noble (Fraserburgh) Ltd in 1974. Her substantial timbers, and those of her sister boat Serene PD 58, bore all the hallmarks of the many immensely strong and often much bigger boats to have slid down the ways of the well-known yard in the corner of Fraserburgh harbour over the years. Built to order for skipper Robert Stephen of Boddam near Peterhead, Harvester’s beautifully varnished hull was 40ft long with a beam of 16ft. She was powered by a Gardner 8LX engine, which developed 153hp at 1500rpm through a Twin Disc 3:1 gearbox and turned a four-bladed propeller. Her steel aft wheelhouse and galley were grained in the traditional manner to match her wooden hull, and the accommodation for four crew was also aft below the deckhouse. Rigged purely as a seiner, Harvester was fitted with a Northern Tool & Gear Mastra seine winch sited well forward, aft of which was fitted the ubiquitous Beccles coiler. Seine ropes were hauled over aft fairleads to the winch before being coiled down into rope bins. Once the trawl wings were up-hauled to the fairleads, the seine net was recovered over a Hydema KB04 pedestal power block at the transom, and the codend lifted aboard via a gantry fitted atop her deckhouse. Following nine very successful years at the seine net in North East Scotland, Harvester was sold down south to skipper Barry Martin from Whitstable, on the Thames estuary. Skipper Martin gave Harvester a new colour scheme of a blue hull and black bulwarks and converted her into a stern-trawler as well as re-registering her as F 98. 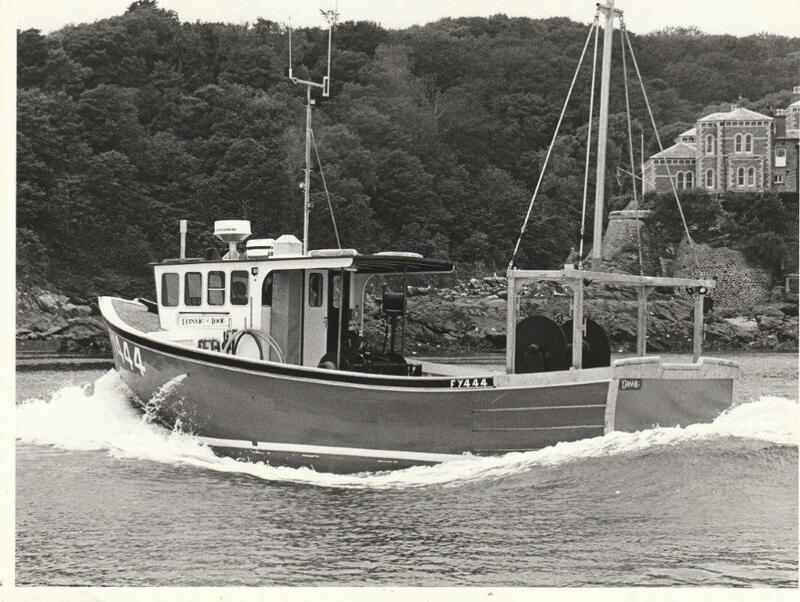 It was his intention to fish her from the Kent port as a single boat and pair-trawler, but delays in selling his other boat, Louandric F 24 forced Harvester instead to be resold, this time to Falmouth in Cornwall under the command of skipper Henry Altenberg to replace his smaller Dixon-built potter, Shearwater II SU 206. Skipper Altenberg soon changed the boat’s number to FH 198 and converted her again, this time into a static-gear boat with the addition of a Grenaa conveyor net hauler forward on her port side and utilising Harvester’s existing Mastra seine winch as a pot hauler on the starboard side, with the addition of a slave head replacing one of the capstans. Harvester proved to be ideally suited to her new role, splitting her time between potting off the Lizard and tangle and wreck netting for ray, monk, turbot and hake, as well as other species as the seasons allowed. The rapidly developing nature of the South West mono-netting industry was reflected in Harvester’s netting gear as well as her hardware. Her Grenaa net hauler was replaced by an updated Rapp Hydema HMH 05, before that hauler, too, eventually made way for the latest Spencer Carter NHO 05 model. Harvester was also the test bed for Spencer Carter’s new net-flaking machine, something that virtually all netting boats now carry, and which has revolutionised the netting industry. Time moves on, and in 2004, around 20 years after she arrived in Falmouth, Harvester was on the move again, replaced by a new 12m Gemini catamaran named Harvester II FH 723. 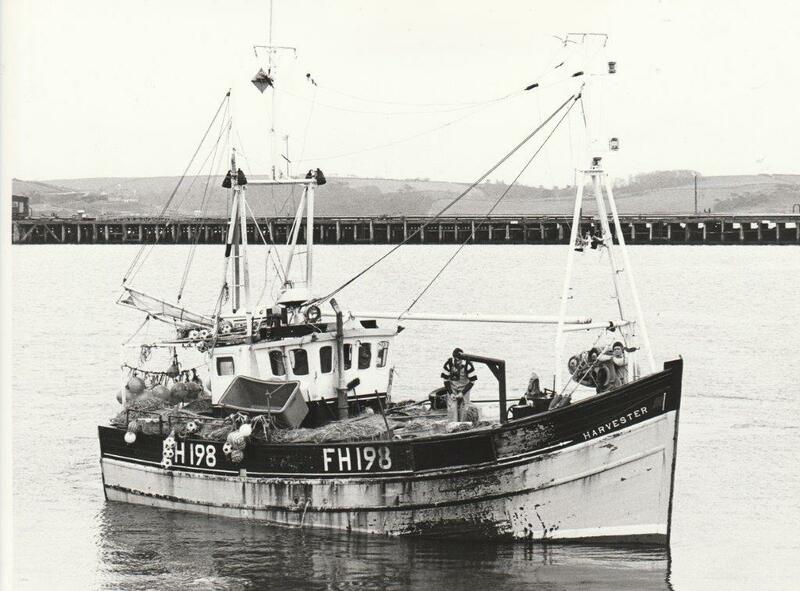 She was sold to Filey fisherman Traff Cammish and was based at nearby Bridlington, joining a rapidly expanding fleet of potters of similar size, operating from the North Sea port. Skipper Cammish modernised the potting system on Harvester, converting her for the self-hauling and shooting of pots, and in 2014 the boat was taken to Grimsby, where she underwent an extensive refit that included the installation of a stylish steel wheelhouse and galley unit, bringing the now 44-year-old boat bang up-to-date. At a time of considerable investment in new boats joining the highly successful Looe fleet throughout the 1980s, Danvic FY 444 was delivered just over mid-way through the decade in the summer of 1986. Built to a Gary Mitchell design by the nearby C Toms & Son yard at Polruan for Looe brothers David and Justin Bond, Danvic was a development of a 33ft design from which three other Looe trawlers, Kingfisher FY 17, Palatine FY 149 and Innisfallen FY 46, had all been recently built. Replacing the Bond brothers’ previous boats Cygnus GM 32 and Zadok FY 276 and named after two of their children, Danvic was similar to her immediate wooden Toms-built predecessors, but slightly longer with an overall length of 35ft and with a registered length of under 10m, to take advantage of the rules in force at the time. She had a beam of 14ft and a relatively shallow draught of 5ft 6in to maximise her operational time away from her tidal home. The iroko-on-oak trawler’s forward wheelhouse and transom stern layout complied with the accepted standard for a modern Looe trawler of the time. Deck equipment from LG Morris comprised a 2t trawl winch with matching 2t net drum together with an LG Morris flat drum net hauler, which was fitted on the starboard quarter should the brothers decide to turn to mono-netting, which was becoming hugely popular amongst the greater South West fleet at the time. Danvic was powered by a Gardner 8LXB engine producing 172hp, which was coupled to a Twin Disc 3:1 reduction gearbox. As well as trawling and netting, the boat was equipped for scallop dredging using four spring-loaded dredges per side to provide a stable alternative income during the months when takings from the local Devon and Cornwall trawl grounds can be somewhat barren. Danvic also occasionally used a single 4m-long beam trawl towed and hauled off her stern in pursuit of Dover sole. Danvic’s short career in Looe came to a premature end when she was just five years old in August 1991, when, having left Looe on the Monday morning tide heading for the trawl grounds, she was in collision with a coaster around 20 miles south of Looe and quickly sank. Thankfully, her two crew were picked up unharmed.